Three airports serve the Washington D.C. area: Ronald Reagan Washington National Airport (in Arlington, Virginia, located four miles from downtown), Dulles International Airport (in Dulles, Virginia, located 26 miles west of downtown), and Baltimore Washington International Airport (located 35 miles north of downtown). 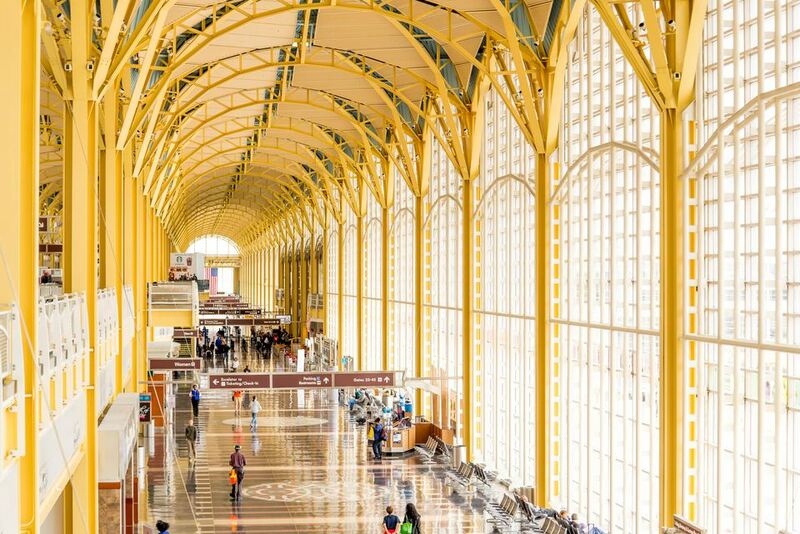 All three airports will get you to the nation's capital region, but you might choose different airports depending on your travel plans. For example, BWI often offers inexpensive flights from budget carriers, Ronald Reagan Washington National Airport is just a 15-minute car ride from downtown D.C. without traffic, and Dulles is a hub for many international flights. For more specific information about each airport and transportation options, see this guide about how to choose the right airport for your travel plans. Ronald Reagan Washington National Airport is about four miles from downtown Washington, D.C., making it a convenient option for tourists and business travelers alike. But you won't find international flights here—a short runway limits the size of the aircraft permitted to fly there, so international passengers need to fly in and out of Dulles or Baltimore. There may be construction when you are there, as the airport is undergoing a $1 billion investment called Project Journey to upgrade its roads and facilities. How to Get There: The airport has its own Metrorail stop on the Blue and Yellow line, so a car may not even be necessary. If you do need to park, options include Terminal A Garage and Terminal B/C Garage. These spaces are connected to the terminals via underground or covered walkways. There's also an economy surface parking lot served by shuttle buses. From Washington, D.C.: Take I-395 South to the George Washington Memorial Parkway South. Follow the signs to the Airport Exit. From Virginia: Take I-95 North to I-395 North. Take exit 10 (George Washington Memorial Parkway South). Follow the signs to the Airport Exit. Or take I-66 East to Route 110 South to Route 1 South. Take the Airport Exit. From Maryland: Take I-95 South crossing the Woodrow Wilson Bridge into Virginia, and follow signs to Route 1 North. Take the Airport Exit. Or Take I-270 South towards Washington, D.C. to I-495 South towards Northern Virginia to the George Washington Memorial Parkway South. Take the Airport Exit. This Northern Virginia airport is internationally known for its striking main terminal, designed by architect Eero Saarinen in 1958. Located in Chantilly, Virginia, Washington Dulles International Airport is a major hub for domestic and international air travel. There are many parking options, including a terminal hourly lot, terminal daily lot, Garages 1 and 2, and an economy lot. How to Get There: For those using public transportation, Metrobus operates an express bus service between Dulles Airport and downtown Washington, D.C. A Metrorail station at Dulles is under construction. For now, you can take the 15-minute Silver Line Express Bus between the Dulles terminal and the Wiehle-Reston East Metrorail Station on Metrotrail's Silver Line. Note: VA-267 (The Dulles Access Highway) is restricted to airport use only. All vehicles on the Access Highway must be going to or coming from Dulles Airport. From Washington, D.C.: Take I-66 West to exit 67 (VA-267 W - Dulles Airport/I-495 N/Baltimore). Follow signs to the airport. From Upper Montgomery County, Maryland: Take I-270 South towards Washington, D.C. Follow I-495 West to VA-267 W - Dulles Airport. Follow signs to the airport. From Baltimore: Take I-95 South to exit 27 (I-495 West) to exit 45A (VA-267 W - Dulles Airport). Follow signs to the airport. From Southern Virginia: Go north on I-95 to exit 170B (I 495 North toward Tysons Corner) to exit 45 (VA-267 W - Dulles Airport). Follow signs to the airport. From Southwest Virginia: Take I-66 East to exit 53 (Rt. 28 North). Follow Route 28 to the airport. Baltimore Washington International Airport is located about 45 miles north of Washington, D.C., so if you're traveling to the nation's capital, give yourself plenty of time to get to the airport and back. BWI airport is a major hub for Southwest Airlines, and there are often more affordable flights here. From Washington DC: Take New York Ave NW/US-50 E to the Baltimore-Washington Parkway. Merge onto MD-295. Take the exit onto I-195 E toward BWI Airport. From Baltimore: Take 295 South to I-195 East toward BWI Airport. From Montgomery County Maryland: Take I-495 East to I-95 N toward Baltimore. Take exit 47A-B to merge onto I-195 E toward BWI Airport. From Virginia: Take I-495 East to I-95 N toward Baltimore. Take exit 47A-B to merge onto I-195 E toward BWI Airport. The Lowdown on Airports Serving Washington, D.C.